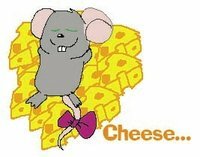 A 4-foot-tall female mouse in a teal-coloured tee and orange pants entered the pizza parlour, which was just off the highway in a small town. "The usual, Amy? ", the proprietor of the pizzeria, a squirrel, said to the small mouse. "Yep! The special you named after me! I'm hungry today! ", she smiled, her giant pink tailbow swayed to accent her enthusiasm. "Well, let's read it off, since i gotta break in the new cook, shell we? OK, that's a regular crust, mildly seasoned, with a white cheese sauce base, a layer of our 6-white-cheese blend, diced chunk salami, sun-dried tomatoes, sweet red peppers, seasonings, then a double-layer of the same white cheese blend, right? ", the squirrel smiled. An old friend, this squirrel- It was her encouragement that got him to start up his dream pizza parlour in the first place! "Sure you don't want the Hawauuan Mousie version this time? That's everything plus pineapple..."
"Nope, just the regular Amy's mousie Special, this time. ", Amy smiled. The taste of the sun-dried tomatoes in the mix was already making her drool. "What size? The usual small, not personal?" "That sounds fine- Might take the rest home." the squirrel laughed. "How about I make it a large- Lots of leftovers!" "I only got a $20, right now..."
"I'll just charge you for the small, plus soda- You're a good friend and customer. The rest is on me." "Why thank you! That might hold me through the weekend! ", the mouse was clearly surprised by the generosity, not expecting such, not even from her friends. "No problem, Amy. Here's your change. It'll be out in about 15 minutes. I see the Giants are on the TV, so why not watch the ball game while we get it prepared for you, OK?" "Oh, I forgot there was a game on, today- Sounds like a good idea!" The squirrel chuckled, "I thought you'd appreciate it. Be out in a bit!" Amy, of course, had a great lunch-- And the Giants won that day. Looks like she found some gouda eats and thus won't get so crusty as time goes on. Cheddar the thought! :o d.m.f. Hey no fair giving out details.... Wait how do you know about our cheese!! Ah well. Funny though I wasn't going to name pizzas after names but possibly characters. I'm was thinking creative things like Doggie (hair) Pizza ~ polish sausage, Italian sausage, thin strips of sun dried tomatoes that might get crispy black, (look like hair?) possibly pepperoni chunks. They are thinking of naming out pizza specials every few months like everyone else. You know the ~ Hamburger pizza ~ Spaghetti pizza ~ Ect. Only I want to name them animal things. *snickers* Chicken, Cajun pesto, onion, bell pepper, is what some are now calling Hot Wing Pizza. There are so many things to try I just want to name a few some funny stuff.
" Ah well. Funny though I wasn't going to name pizzas after names but possibly characters. I'm was thinking creative things like Doggie (hair) Pizza ~ polish sausage, Italian sausage, thin strips of sun dried tomatoes that might get crispy black, (look like hair?) possibly pepperoni chunks.
" They are thinking of naming out pizza specials every few months like everyone else. You know the ~ Hamburger pizza ~ Spaghetti pizza ~ Ect. Only I want to name them animal things. *snickers* Chicken, Cajun pesto, onion, bell pepper, is what some are now calling Hot Wing Pizza. There are so many things to try I just want to name a few some funny stuff. There is an awesome blend of Pesto sauces, I can't remember the name at the moment. But they do have the regular pestos plus BBQ, Cheese, and Spicy types. Many of these are used with others to mix up things for pastas and dips but I was the only one who used them as Pizzas up until 6 years ago. Went to the food show at the end of last year and yes some are starting to use them on pizzas. ~ To bad no chicken cause I was going to use the SouthWest Pesto, Chicken, Rosted red peppers and eggplant, and fire roasted corn. That is one of the awesome specials I never got permission to put out before they sold the restaurant. Although as I think I have said before I was making Taco, BLT, and Spaghetti pizza over 15 years ago. DO NOT PUT DOWN what you haven't put in your mouth. BTW, Pine nuts, Pine nuts are excellent when cooked on a pizza. Especially since the Pine tree cone is supposed to open fully under heat, Fire help to let the seeds out so they can regrow afterwards. Mouse more like the ones I had, not anthro.